This summer I was doing some refit work on Mat Ali. She is a Harrison Butler Khamseen, built in peninsular Malaya during 1935. An interesting boat with lots of stories to tell no doubt. Part of the refit work meant removing the (non original) rubbing strake to access the chainplates and once off it became apparent that Mat Ali’s sections were perhaps not quite to her lines. 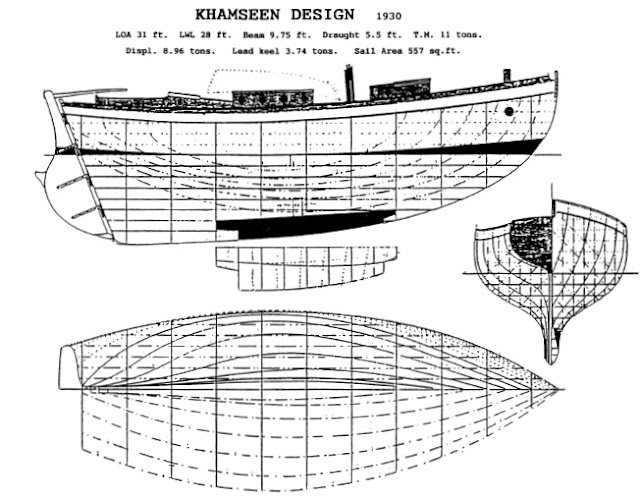 The design lines (a rough copy of which are published) show sections with the traditional tumblehome that you would expect of a Harrison Butler. Looking, however, at the midships section of the boat as she is now, it was clear that someone, at some point, had taken liberties. Not only had Mat Ali been equippped with tumblehome – but the tumblehome had, over the last plank or so, been reversed out and turned into a subtle but definite flare. With some boats you might reasonably ask the question ‘has she moved/pinched/hogged’ to create this effect, but Mat Ali, built over 4″ sawn frames, is a bit too stiff for that sort of movement. Besides, the covering boards (original) continue the flare in line with the sheer strake, the frames sit cleanly against the planking and the boat shows no other signs of movement. The extent of the flare is not huge but enough for me to need to bend the re-galvanised chainplates by 1/8″ when tightening the bolts up in order to get the chainplates to sit flush against the planking. These sorts of things don’t just happen by accident. I guess that this sort of ‘interpretation’ of a set of lines is the way in which builders make their mark on a design. My fancy is that Mat Ali (the builder of Mat Ali), who had never built a yacht before, but had a lifetime of experience in building Malay working craft, had some strong opinions about the way that things should really be done – and adding flare to tumblehomed topsides was his contribution to how a real boat should be finished off. What I have not yet been able to establish is if tumblehome reverting to flare is/was a feature of any Malay craft and what the proper term for this feature is anyway. 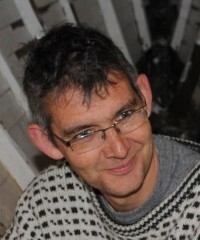 Posted in boatbuilding and tagged harrison butler, htumblehome on October 23, 2011 by charlie.